When I was a teenager, I could only dream of such a modern and creatively designed space for myself! This is a room for a teenage boy, it’s a whole residence, I’d say, because it has two floors. 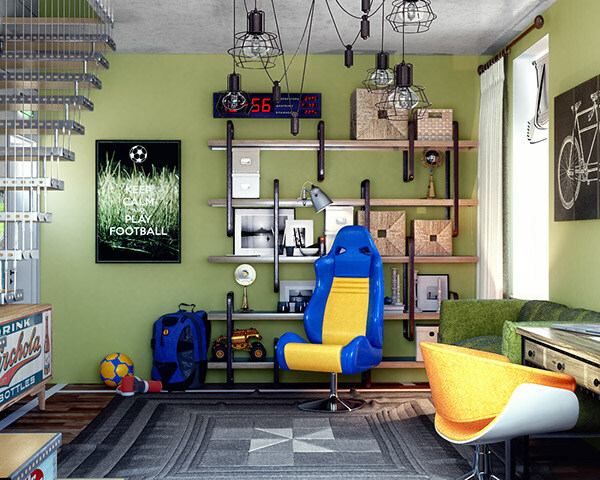 The style used is industrial and bold modern, which is great for a boy’s room. There are different colors: green, blue, red and others. The first floor is dedicated to studies and hanging out with friends. 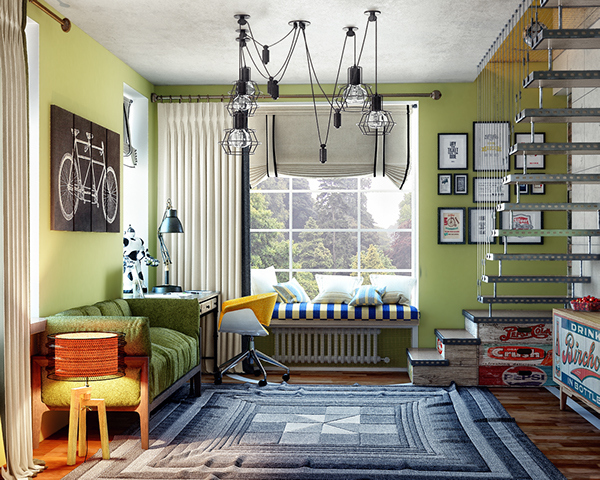 There’s a small industrial desk and wall-mounted industrial shelves for various stuff and books; industrial bulb lamps light the space creating a bold young man room. 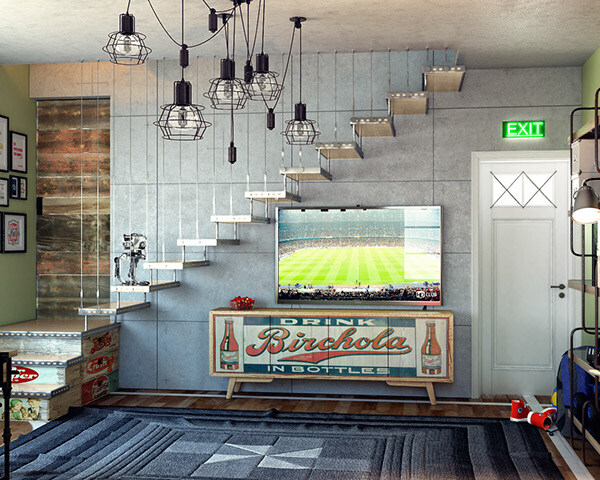 Though this area can be used for inviting friends and watching TV with them – there’s a comfy bold sofa and a TV in front of it. Colorful chairs and seats highlight that it’s a teenage space. The upper floor is an attic bedroom, a private zone of the boy. 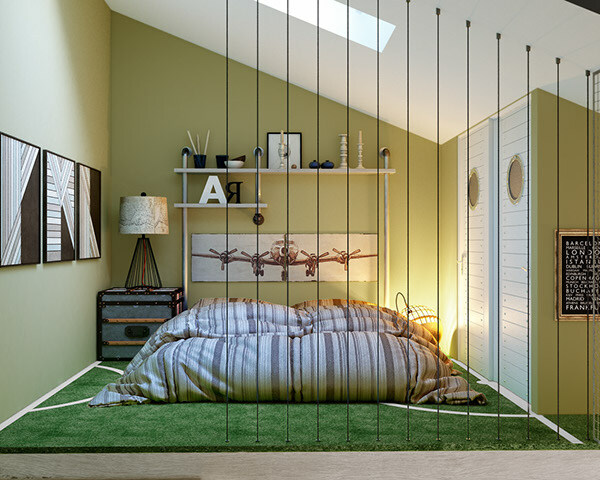 There’s a bed right on the floor, an industrial nightstand and shelves. 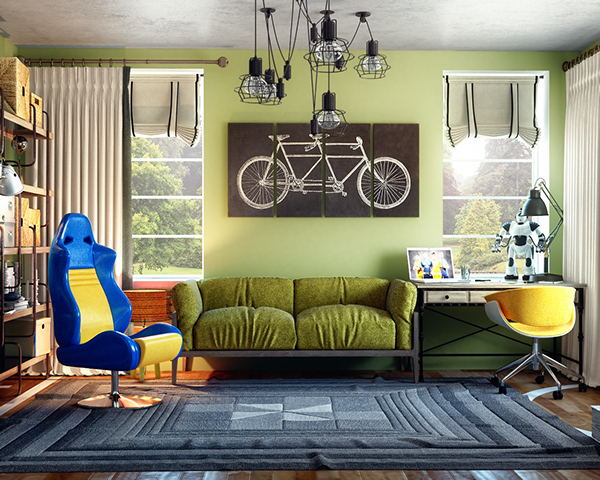 Bicycles and planes are among the passions of the young owner, so they are placed here and there as artworks and models, and they add to the room décor. I like the use of concrete and reclaimed wood on the wall to make the space rougher and more industrial.